Submitted by Alexander Briones on Apr. 3, 2019.. 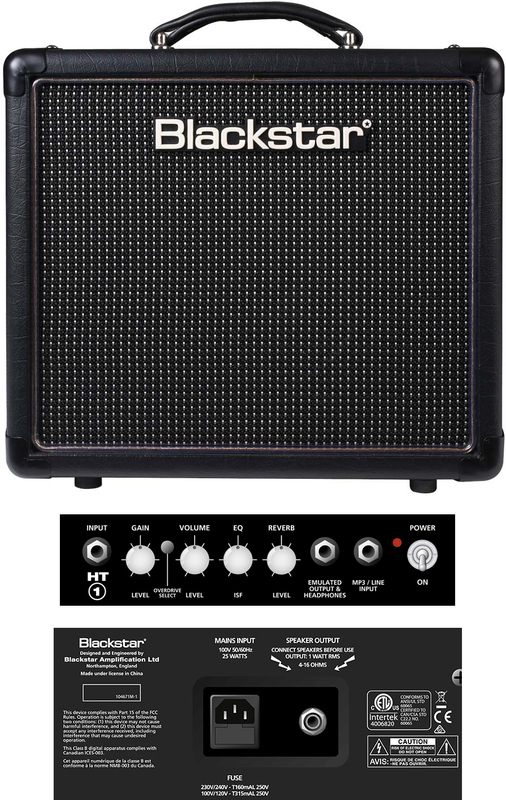 The Blackstar HT-1R is a compact tube amp that's designed to produce genuine cranked tube tones at lower volumes. This is the same as the lower priced Blackstar HT-1, with the only difference being that the HT-1R includes reverb while the HT-1 does not. This is made possible with a 1 Watt amplifier circuit that houses an ECC83 preamp tube, which is essentially a 12AX7 just named differently by Europeans, and a ECC82 poweramp tube - also called a 12AU7. Complementing its real tube components is Blackstar's ISF circuit, which behaves like a fine tuned filter and EQ to add US or UK amp tone flavors to your sound. Many users describe the Blackstar HT-1R as the best bedroom tube amplifier, and it shows in its ratings. Because of its 1W amplifier, many users are able to get inspiring overdriven tones without disturbing the neighbors. Even Al Santangelo from Premier Guitar is impressed and we quote, "the real wonder of this 1-watt Blackstar is that it pumps out the crunch and demonstrates the break-up characteristics of a much more powerful amp at levels that border on inaudible". Others find its versatility to be incredible, thanks to Blackstar's ISF technology, which makes it standout when compared to regular tube amps that have limited voicings. While the ISF feature allows for basic tone shaping, some users who want more control find the lack of basic EQ to be annoying. Still, the default sound works well in most situations, but may not sit well with those who want to shape their sound. A few users notice significant volume increase when switching from clean to overdrive channel, but it maybe more of a natural increase due to gain settings. Note that while 1 watt may seem weak, it can damage the speaker if you set the volume too high for extended periods. The Blackstar HT-1R is the perfect bedroom tube amp, ideal for those who want good plug-and-play tones without disturbing others.